We love to see so many great items we can review to add to the MOJO™ marketplace. Ranging from MOJO™ veteran authors adding new work, to new faces with some of the most premium templates we’ve seen. Why don’t we take a look into what was added this summer to date. We love to highlight the Premium WordPress Themes category, but we wouldn’t leave out any of the new HTML website templates . For those who have been waiting for a new eCommerce Theme, three have been added from some great authors. Let’s begin the round up. XYZ WordPress Theme – is a creative responsive WordPress Theme, it will automatically fits your screen size and looks just as great on the iPhone as it does on the desktop. Easily customizable via the WordPress Admin Interface, upload your own logo, change the color of the theme in one click. , Built-in swipe support for your portfolio, images and video. 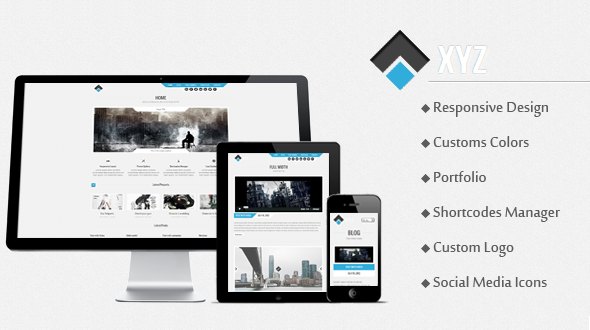 XYZ can be used as a Portfolio or as a Blog. 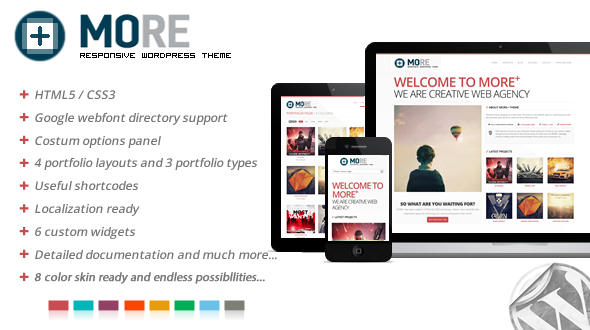 More+ WordPress Theme – is a powerful responsive business/corporate/portfolio & blog premium WordPress theme. MORE+ has been coded in HTML5 & CSS3, jQuery and built with Bootstrap Framework. MORE+ will fit your large desktop screen, all the way down to your iPhone – and of course any Tablet or iPad. Zypo WordPress Theme – is a fully Responsive WordPress Theme built on a highly intelligent framework. It’s the perfect theme for everyone in need of a professional online presence. It comes with many cool features ex. Drag and drop homepage modules, Contact form builder, Unlimited color & backgrounds, customizable elements’s color and font. There are also 100+ advanced shortcodes with Shortcode Generator support. You can also use 250+ custom fonts from Google and cufon Fonts. Ethereal WordPress Theme – is a minimal looking theme on the outside but it’s packing some serious features under the hood. Everything you want in a theme to impress a client or visitor. Powerful, clean, elegant are just a few words that come to mind when you see this theme. It should be a no brainer what theme is desired when Ethereal is presented to anyone. Beta WordPress Theme – Beta is a revolutionary WordPress theme designed to look great, function beautifully and promote you and your business well beyond the webpage. This HTML5 WordPress theme comes packed with features such as: Unlimited Color Customizations, Email Newsletter Integration with Mailchimp-ready RSS Feature, Facebook Landing Tab Page Template with step by step how to, Touchcarousel with iphone swipe gesture support, Social Integration (links, tweets and sharing), the list is endless. With built-in customizable Mailchimp newsletter templates and Facebook landing templates, this theme is truly one of a kind. Amazing! 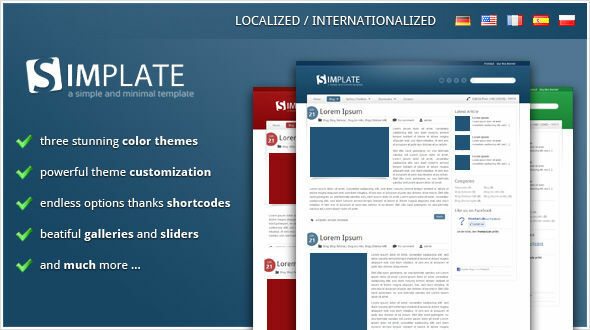 Simplate WordPress Theme – stands for simple and minimal template. And the name describes exactly what the theme is: being easy to use with a bunch of features. Including; Three stunning color themes, Responsive galleries and sliders, Google fonts in headlines, Already translated into german, english, french, spanish and polish (localized)! Social buttons and many more. Videology WordPress Theme – is a WordPress theme that is rich in visual features, easy to customize with or without programming knowledge, and tested thoroughly to be fast and stable. 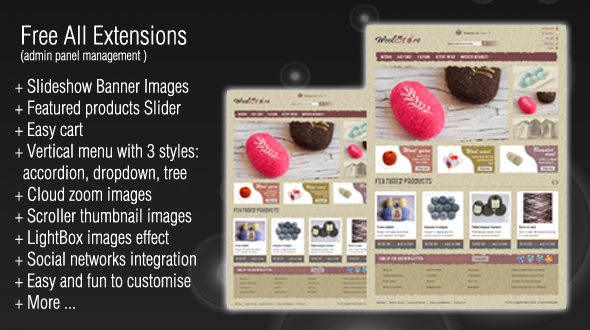 Some features include; There are two types of content sliders you can use in the home page – main slider and news slider. 9 custom widgets, Short-codes, Color Customizer, Typography and HTML Elements Styling, Search Engine and Social Media Optimization, and many many more. Swish WordPress Theme comes packed with an easy-to-use un-branded Options Panel, great documentation, support forums if you need them and is ready to bring your site to life! Swish is suitable for absolutely any type of site, portfolio, showcase, creative, business this theme can do it! Swish is built around my popular CSS framework Workless. This means not only do you get all the usual WordPress goodies, you also inherit all the classes and helpers from Workless! This will make your life much easier and get your site running as fast as possible. If you love WordPress, take a look at all of the WordPress Themes on the MOJO Marketplace. 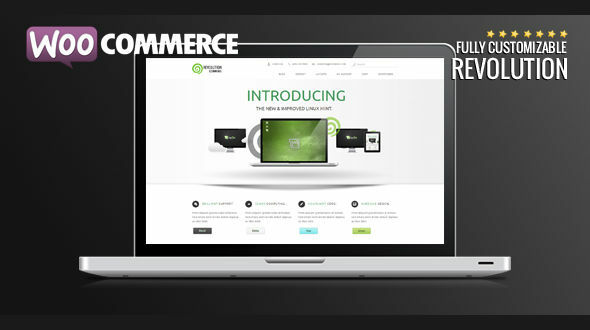 Revolution WooCommerce Theme – is clean, spacious, stylish & a highly customizable wooCommerce theme. Setup your own store in mintues with Revolution Commerce! Gadgeoo WooCommerce WordPress Theme – is a clean, ultra responsive WordPress eCommerce theme built specifically for WooCommerce. We’ve spent countless hours refining Gadgeoo on both the iPad and iPhone to deliver a beautiful shopping experience. From top to bottom this theme is loaded with function that is so easy to use. Make your store stand out with this premium WooCommerce Theme. 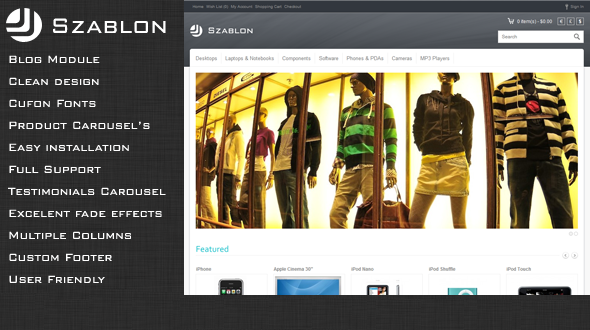 Szablon OpenCart Theme – is Clean and Modern OpenCart Theme. You can use this theme to any type of shop! Be sure to checkout the live demo to see this theme in action! Need a eCommerce theme? Check out more eCommerce products from MOJO™. Electronic Store Magento Theme – Introducing the Electronic Store Magento Theme! Completely unique design that comes packed with features using the Magento platform. Here’s a quick list of some of the features including in the this Electronic Store Magento Theme; Free Extensions include package, Full package with Latest Magento version + Full MA extesion + Sample database like live demo site, Featured product slider display featured product in home page, New products slider extensions, Cloud zoom Images with lightbox, and so many more! Wool Magento Theme – What a great concept. If you can sell anything with any Magento Theme, this is the one that will do it. Display your products with some of these great features. Full package with Latest Magento version + Full MA extesion + Sample database like live demo site, Featured product slider display featured product in home page, New products slider extensions, Cloud zoom Images with lightbox, and so many more! 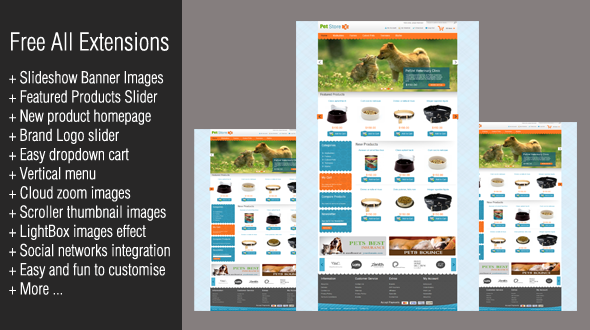 Pet Store Magento Theme – Introducing the Pet Store Magento Theme! Completely unique design that comes packed with features using the Magento platform. Here’s a quick list of some of the features including in the this Pet Store Magento Theme; Free Extensions include package, Full package with Latest Magento version + Full MA extesion + Sample database like live demo site, Featured product slider display featured product in home page, New products slider extensions, Cloud zoom Images with lightbox, and so many more! Cake Shop Magento Theme – Introducing the Cake Shop Magento theme! Perfect for anyone looking to get their store online, sell cupcakes, deserts, scrapbooking items, so many possibilities! ; Free Extensions include package, Full package with Latest Magento version + Full MA extesion + Sample database like live demo site, Featured product slider display featured product in home page, New products slider extensions, Cloud zoom Images with lightbox, and so many more! OneFolio – Responsive Full Screen Portfolio – is a responsive portfolio. Ideal for photographers and agencies. Designed in a minimalism style, is focused in your images and works. This is one of my favorite templates I’ve ever seen. Period. Rollon Responsive HTML Template – is a bold and clean but still professional template suitable for any business or portfolio, and its created by using CSS3 scrollers with beautiful animation. With a responsive design it is easily usable with any device desktop, tablet, mobile phone. Have Fun! 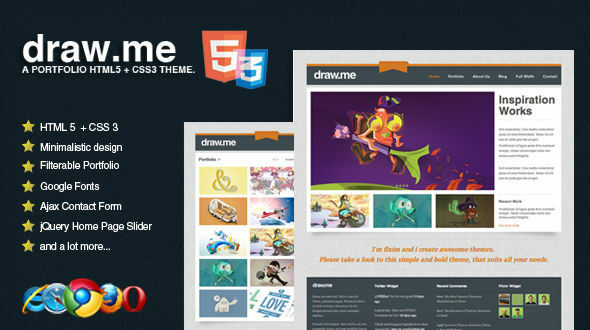 draw.me HTML 5 + CSS 3 Portfolio Template – is the perfect theme for the illustrators, freelancer, creative agency or general business. 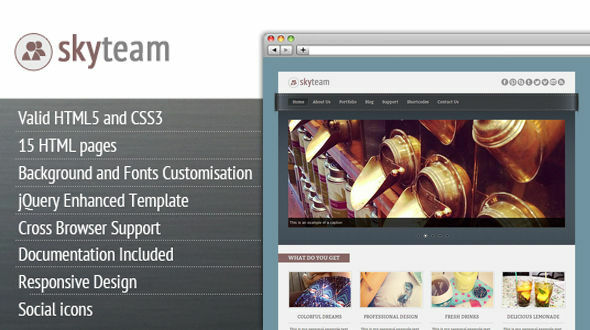 A very clean and easy theme, HTML 5 and CSS 3 make it ready for the future of web. This theme its ready and designed to be coded for wordpress. Have fun with it. BeautySalon – Premium HTML Template – BeautySalon is a clean and modern template, best suitable for your portofolio or business site. Quick and easy set up. Have fun! Hey! come and see all of our Site Templates on the MOJO Marketplace.